I am the heart of Cape Breton. Sheltered on all sides by rugged hills. Fed by the heights surrounding me. Streams and rivers flow to all my arms and inlets freshening my saltiness. I have deep gorges and sheltered bays ensuring a large variety of habitats for all who live within and around me. The sheltering hills ensure I am warm in the summer and stay fairly calm. No extremes. Water transpires from my surface to be returned to the hillsides and thus to me: cycles recycling. Shelter presents me with only one problem: anything that flows into me stays with me for a long time, thus changing me. As more people have been drawn to my shores more and more stays with me and I am changed. Change isn’t always for the better. For as long as we have lived around the Lakes, the Bras d’Or watershed has sustained us by providing water, food, recreation, and economic opportunity. It was the first, and continues to be an important, transportation link for all residents and visitors. Over time harmful actions occurred, many unknowingly, and the ability of the Lakes to sustain us as a community has been diminished. The time has come for all of us dwelling around the Bras d’Or to take it upon ourselves to stop our short-sighted ways and learn and re-learn how to live with the Lakes in a sustainable manner. We call the Bras d’Or Lakes golden because they are beautiful, rare and precious. The CEPI continues to support efforts to divert wastewater from the Bras d’Or, including helping pump-out station operators and boaters comply with the Bras d’Or’s non-discharge of boating sewage designation. There is zero tolerance for the dumping of sewage from pleasure boats into the Bras d’Or! Clean water is essential to the survival of eels, dragonflies, salmon, trout, eagles–and us. 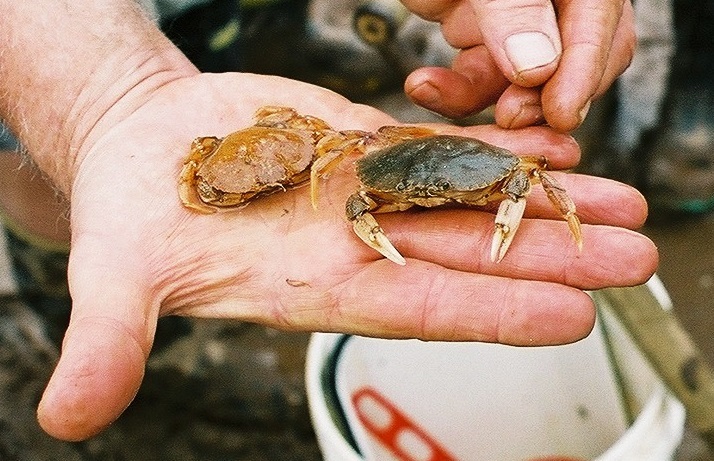 The Bras d’Or Lakes are home to shellfish, plants, fish, insects and animals. We all have a part to play in the conservation and protection of the Lakes. It is important that we use our land properly. 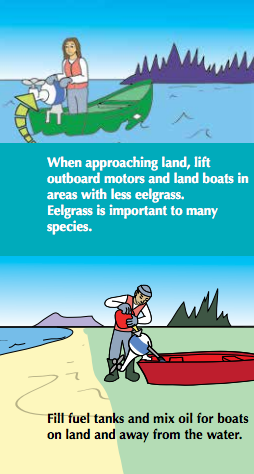 All of our actions affect the rivers, ponds, wetlands and streams that flow into the Lakes. Do Your Part to Protect The Lakes! To minimize erosion along any watercourse, leave trees and fallen natural debris along the shoreline. Plant trees, shrubs or other groundcover to absorb the energy of the water rather than installing rock or concrete walls. Leave boulders, gravel and natural debris in streams to provide shelter for fish. Only remove non-natural items (tires, bicycles, and other garbage) from watercourses. 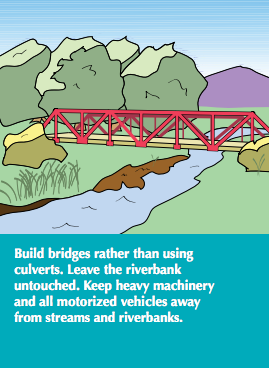 Use curved pathways to the shore so there is no direct run-off into the water. Share paths with your neighbour instead of creating many along the same shoreline. Use silt fences to redirect run-off and debris during construction. 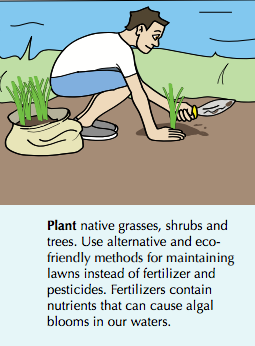 Plant native grasses, shrubs, and trees as soon as possible after construction or other disturbances. Build homes or cabins at least 1.25 m /4.1 ft above the high water mark to protect from sea level rise and storm surges. Use lined fire pits instead of open fires. See a recommended fire pit design at uinr.ca/library/ publications-reports/ Refrain from setting grass fires. Grass fires contribute to erosion by destroying ground cover. Ensure that onsite sewage disposal systems maintain a 30.5 m (100 ft) separation from any watercourse. An onsite sewage system consists of a septic tank for settling and treatment as well as a sub-surface disposal field. All systems must be approved by NS Environment. For additional information visit: www.gov.ns.ca/nse/wastewater/ on.site.sewage.disposal.asp. The Bras d’Or Lakes are a nondischarge zone for boating sewage and dangerous chemicals. 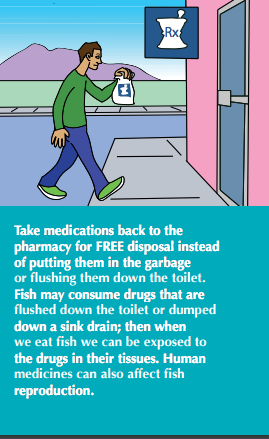 Pump out your sewage at a dumping station in St. Peter’s, Ben Eoin, Grand Narrows, Whycocomagh, Baddeck or Kempt Head. 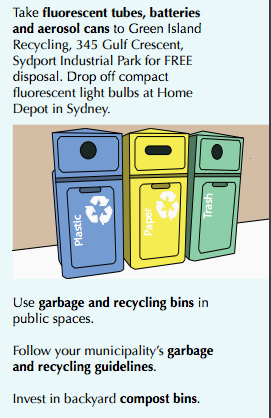 Take advantage of annual municipal heavy garbage pick-up. Remember to pile items in areas away from water. Dates and details can be found on your municipality’s website. 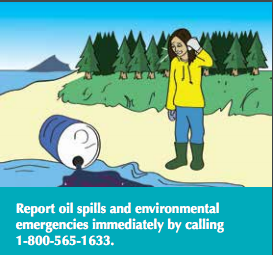 Leaks from furnace oil tanks contaminate soil and water supplies. Maintain your tank by looking for damage, rust or signs that it has moved. Remove leaves and other debris and protect the oil supply line from the weight of snow and ice. If moved, level the tank immediately. Use environmentally friendly, phosphate-free and biodegradable cleaning products including laundry detergents, soaps, shampoos and conditioners. Phosphates contain phosphorous. Too much phosphorous can cause algal blooms, which block sunlight for aquatic plants. When algae dies, it uses up oxygen in the water and cause fish to die. Use proper needle disposal. Needles and blood sugar lancets are an environmental and health hazard. If possible, donate electronics to a local charity or take them to one of the ACES drop-off locations. Go to acestewardship.ca for the full list of accepted electronics. ACAP Cape Breton has a computer recycling program that accepts computers, monitors, and cables. 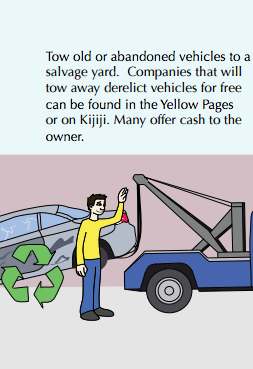 Tires and left-over furnace and motor oil can be taken to a local garage for FREE disposal. Refrain from burning garbage, tires and pressure-treated lumber. Harmful chemicals eventually reach water through rainfall. Use a high-pressure wash to clean boats or gear to remove invasive hitchhikers like tunicates and seaweeds. The boat and gear should then be completely dried out before use in the Bras d’Or Lakes. Prepare or freeze fish, lobsters or other catch caught in other areas rather than holding them in the Bras d’Or Lakes. This reduces risk of introducing parasites, viruses or diseases into the Lakes. Practice water conservation. Collect rainwater to water plants. Wait for a full load to run dishwashers and clothes washers. Take showers instead of baths. Fix leaks. Only human waste and toilet paper should be flushed. Anything else can cause lift station breakdowns, sewer malfunctions and back-ups leading to overflows and release of untreated sewage. Only take gravel from approved gravel pits. Leave gravel on sandbars and beaches so they will be less vulnerable to sea level rise. It is important that we use our land properly. 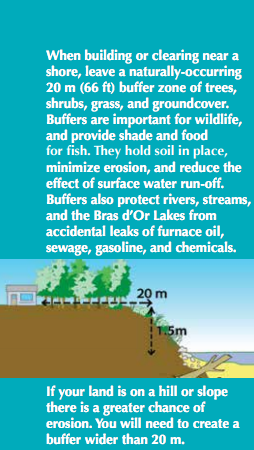 All of our actions affect the rivers, ponds, wetlands and streams that flow into the Lakes. We are all connected. 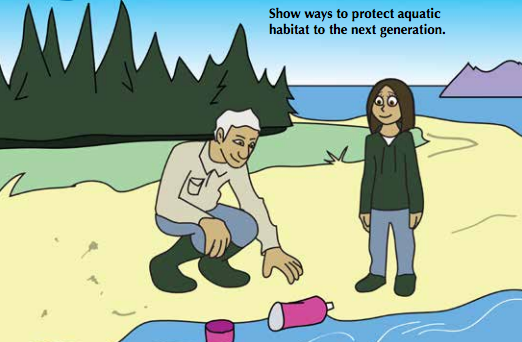 From the CEPI brochure "Things You Can Do to Protect the Bras d'Or Lakes". Illustrations by Chris Andrews. "It is not too late: the Bras d’Or Lakes are still relatively pristine, and with your help we can ensure that our sons and daughters, and their sons and daughters, have the same kind of fond memories we have. Perhaps you may think that your contribution may not make a difference in your lifetime; however, it may make all the difference for generations to come." Do You Know Someone Who Is Making A Difference? If you or someone you know has made a positive difference in our watershed, we want to hear about them! The Golden Awards recognizes the achievements of individuals or groups who have had a positive impact by helping protect and/or restore the natural environment of the Bras d’Or Lakes and its watershed. We present awards in four categories; Youth; Individual Adult; Business or Industry; and Community Group, Municipality or First Nation.